Objective completed: You saved the ship from the ninjas, only to have to whole adventure blow up in your face. Rhubarb had decided to save you from Captain Blackberry this time... but now you owe him! 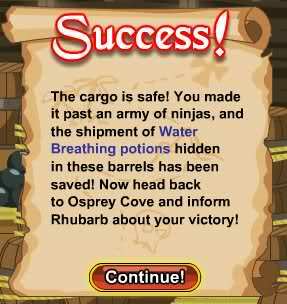 Rhubarb: which was shipping a load of Water Breathing Potions to SwordHaven! Once we sell all those Water Breathing Potions we will all be rich! Rhubarb: But the ship was over-run with ninja's before it reached the harbour. This ship is anchored just outside the cove right now. Rhubarb: The ninja's are looking for the potions but we hid them amongst the gun powder barrels in the Powder Room. Rhubarb: If we can't have those Water Breathing potions... NO ONE WILL! Get moving matey! Rhubarb: Well done! Ye really showed those ninjas what happens when they try to steal our stolen goods! Rhubarb: We should make enough money gold from the sale of those water breathing potions that we can all retire! 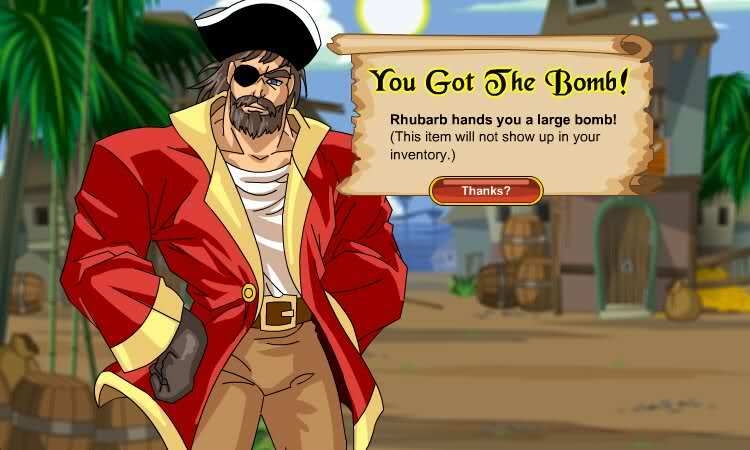 Rhubarb: <Character> what did ye do with the bomb I gave ye? Rhubarb: ...NO ONE WILL NEED WATER BREATHING POTIONS EVERY AGAIN! THEY CAN JUST... JUST BREATH THE OCEAN! Rhubarb: Oh well, atleast the ninjas didn't get them either. I'll just tell Captain Blackberry that they blew up the ship. Rhubarb: I'll save ye from the Captain's wrath this time but if ye blow up one more ship... so help me, I'll sell ye out faster than you can spit on a seacow! Rhubarb: Ye owe me, <Character>. Ye'll have to work for me for a looooong time to pay off those potions, and that ship. Rhubarb: Let's get back to work then, swab! -- Andy8 for Monster information. -- Stephen Nix for corrections.